There’s clearly a lot to think about when it comes to adopting the right payment model for your practice. But the wealth of options often means confusion for care facilities and providers. There will be constant questions of whether patients are on APMs, MIPS or traditional fee-for-service plans on top of who the payer is and what insurance plan the patient has. MACRA (CMS) has two components that oncology practices should pay special attention to. These are MIPS and APMS, which are separate from other value-based arrangements provided by private payers. Nevertheless, they are important to understand because the scale of MACRA can be daunting. Knowing about each payment plan can help you make the right decision for your practice. MIPS consolidates former quality measures into new categories for data reporting. And two APMs are oncology-specific paths: the Oncology Care Model (OCM) and Oncology Medical Home (OHM). The OCM focuses on ensuring accountability for chemotherapy administration, navigation and care coordination. The OHM model centers the patient’s care on an interdisciplinary, physician-led care team, which provides coordinated services across the spectrum of cancer treatment. 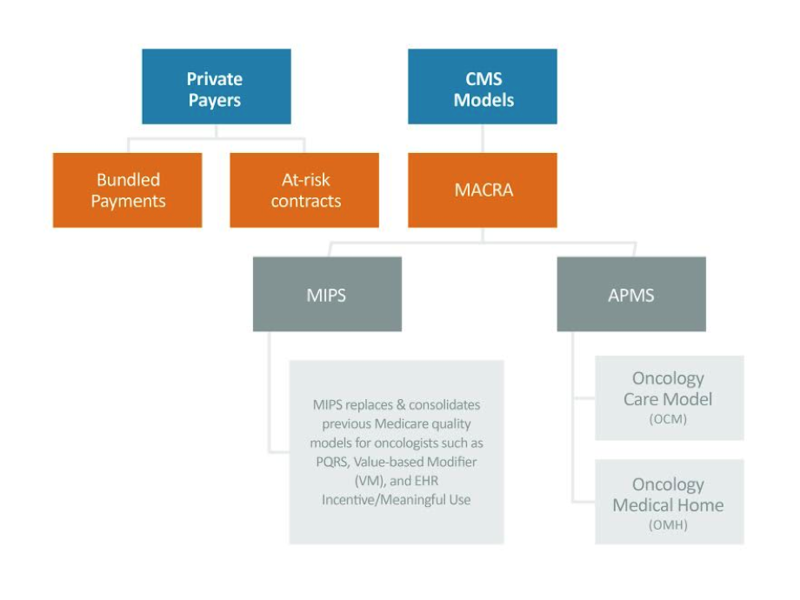 Check out the graphic below to see how all of these payment models fit together in the MACRA puzzle! Takeaway #1: Executives and providers need to work together to ensure the chosen model’s requirements are met. Lack of communication and coordination can result in costly decisions. Further, functioning as a team leaves less room for error and more for collaboration. For example, jointly purchasing IT systems allows all involved to reap the benefits and avoid making redundant investments. This isn’t a MACRA-specific problem, though. Coordination is crucial to value-based care across all specialties. Takeaway #2: According to HFMA, "Under the new MACRA law, physicians who are part of advanced alternative payment models, which include one of the two OCM tracks, will qualify for 5 percent annual bonus payments starting in 2019 instead of facing possible cuts under MACRA’s other track, which uses a complex quality measurement system." Takeaway #3: The majority of providers that participate in value-based care models are implementing clinical pathways for decision-making support. These systems aim to reduce variability in treatment, spending and care coordination by aligning all involved to specific objectives mapped to the payment plan’s requirements. The more streamlined decision-making is, the less likely providers are to get caught up in the pitfalls of poor reporting. The new reimbursement ecosystem will no doubt take some getting used to. But with these specifics in mind, oncology practices can ensure that they take the time to consider all available options. Success will come from understanding the requirements and working together to drive the transformation of true, value-based care. In the end, the entire goal is to generate positive outcomes – and that means everyone wins.